Dimensions: 4 15/16 x 3 15/16 in. *Date: Only one observed impression of this etching is dated, and the date appears in Fiene's typical fashion, in pencil just to the right of his signature, l.r. : "24--". A catalogue of Fiene's exhibition at the New Gallery, New York City, in 1924, includes a portfolio of eleven unspecified etchings but no prints in any other medium. Presumably this is one of them. 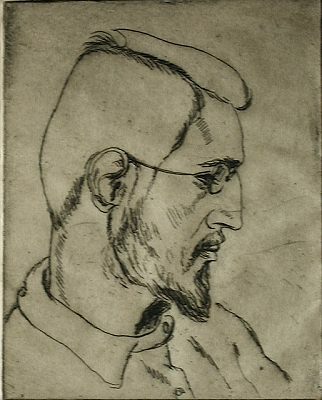 In 1923 Fiene studied etching at the Art Students League in New York City under Joseph Pennell and Eugene Fitsch. It is likely that the eleven etchings in the New Gallery show (including catalog #s 13-16) are related to that study. ***Printer: Fiene printed some of his early etchings himself, indicating this by writing "Imp" (Impressit, Latin for he/she printed it) after his signature. This may be the case here. ****Annotations: The only observed, annotated impression follows Fiene's typical annotation pattern.